When it is time to handover the lease of your retail space to the next tenants, you must return it the way you first received it, empty and vacant. As a shop tenant, completely stripping your retail space may seem like an impossible task. Especially if you have owned the space for many years and have accumulated a lot of items. If there are unnecessary junk and items that needs to be removed and dismantled in order to comply with the ending of your shop’s contract, a professional service should always be considered. Large and heavy equipment requires specialised tools and machinery to tackle the task efficiently and competently. Finding a way to get rid of your retail shelves and fixtures is easy. Paul’s Rubbish Removal is a cost-effective way to strip out your retail space and get it prepared for when the day comes to handover your lease. Big bulky shelves are no problem for us. We have been in the business for over 10 years to safely carry out the removal process professionally. 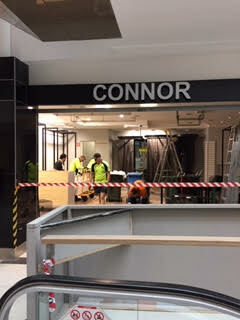 What Does a Retail Strip Out Involve? A retail strip out involves completely removing the interior of a retail space including all the furnishing layers down to the exposure of the building’s structure. 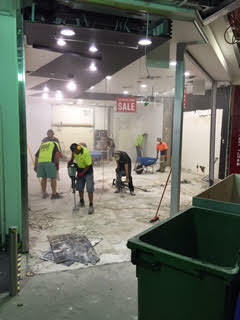 Paul’s Rubbish Removal can safely and efficiently strip your retail shop completely clear. After dismantling all the necessary objects and infrastructure, we will clean up any debris and junk that needs to be disposed of. Our experienced team will load our trucks with your unwanted retail waste to leave a clean and tidy retail shop. Anything else that you would like us to get rid of! What Does a Retail Demolition Involve? A retail demolition job involves the tearing down of non-temporary structures. These structures include the retail electrical infrastructure, internal walls, kitchen, bathroom, flooring, ceiling, door frames and any non-load bearing walls. Paul’s Rubbish Removal team is highly qualified, experienced and dependable to achieve the retail demolition needed to get the job done. Our small demolition service includes the removal of external and internal structures that requires heavy machinery. We perform each and every retail demolition task with the highest level of safety and standards to comply with the code of practice demolition work in NSW and ensure the safe integrity of your building. Whether your retail space is big or small, Paul’s Rubbish Removal are trained experts to make sure that your space is absolutely clear of rubbish and fixtures so that your retail hand over is smooth as butter. We are extremely flexible to work at any time to provide you with as much convenience as possible. We are able to strip your retail interior, demolish any man-made structure, whether fixed or temporary and completely clean up any debris or unwanted rubbish in your store. We also provide this type of service for residential and commercial strip outs. We are available 24 hours a day across 7 days a week to provide you with a free quote on 0407 125 125.